Until the years around the start of the 20th century, there was no State pension or sickness benefit. Most people in need relied on small sums (or goods in kind) from parochial funds. These were collected and distributed through the church. There was only a small number of charities. Everyone had to make the best provision they could. The lucky few were the wealthy. Members of trades incorporations and fraternities were also fortunate. 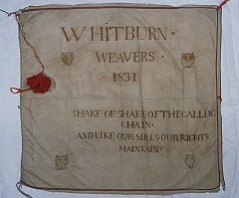 The mutual aid and benevolence of bodies like the Whitburn Weavers were as important as their role in trade and business regulation. But trades incorporations were exclusive bodies: not everyone could join. However, it seems gardeners and masons had always admitted 'free', 'accepted' or 'gentlemen' members. The extension of this idea was the friendly society; a body to which anyone that could pay entry money and a regular subscription was admitted. 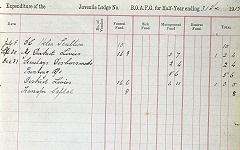 The subscriptions and investments made by friendly societies were managed to give the members benefits. Pensions, sickness payments, marriage and death grants were all available to those that could satisfy the entrance criteria. If income from entry money and periodic payments was more than the benefits paid out, a society was healthy. But if payments exceeded income then it could fail. No accurate calculations of fee versus payment existed at the start of the 19th century. So many societies really relied on luck. Naturally, lots failed. In the first half of the 19th century a series of inquiries and reports began to solve the problem. One of the most important was the Report on Friendly or Benefit Societies by the Highland Society of Scotland in 1824. Its tables were adopted by many societies. Many later improvements were backed by legislation. By the end of the 19th century most societies published complicated tables of contributions and benefits so members could compare with others. Trustees and auditors regularly checked accounts. Sometimes, there was no need for difficult sums. Insuring a cow on an annual basis was an easy calculation. Calculating a death grant based on a small monthly, quarterly or annual sum was easy when inflation was low. 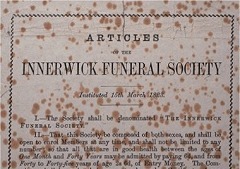 Innerwick Funeral Society kept its payment at £3 for almost a century from 1823. Providing State benefits complicated the administration of societies and led to a surge in membership around 1911-12. Professional secretaries and treasurers working to official guidelines were employed to run these services. The National Insurance Act of 1946 nationalised pensions and benefits.